April Book Club Selection: Burchard’s Millionaire Messenger | WHAT’S UP WITH THAT GREAT BOOK YOU NEVER FINISH READING? Brendon Burchard is the heir apparent of the motivational speaking stage as the current generation of motivational platform speakers begins to slow down. 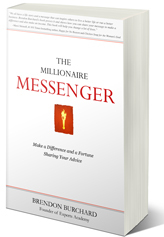 In his latest book,The Millionaire Messenger: Make a Difference and a Fortune Sharing Your Advice , Burchard makes the argument that with the proper framework, we each can recognize our expertise and get our message out to the world. The book also is a call for reformation of the “Expert Industry”. Burchard is a credible spokeman for this cause as an honest businessman who consistently over-delivers to his customers. Are you energized or wearied by the thought of being an expert? Why? Is there truly an “Expert Industry”? What are the obstacles in your way as an expert? What is your next step to getting your message out to the world? Join us for discussion at Laura’s Library in Austin on Tuesday, April 19, 2011 at 6:30 pm CDT or by clicking the event link. Now, which of your messages are you going to share with us here below?